artumn: No beginning. No end. 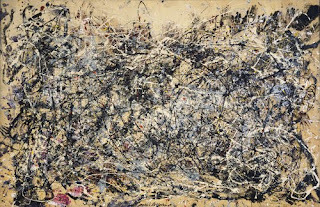 Pollock is a true innovator in the art world. Although violent in method, and also said to be violent in person, he gave an entirely new light to the already popularized method of Abstract Expressionism. The piece says chaos and drama and evokes an unmatched feeling of pandemonium that you simply can not look away from. This technique he created is called Action Painting and allows Pollock himself become a part of the painting by pouring and flinging paint onto an unstretched canvas with sticks or knives. The technique ultimately creates an entanglement of lines and blotches almost like a bundle of nerves in your brain all perfectly color coded. The color palette, in itself, is dark and austere. The only color that really stands out from the giant cluster is the smears of rust on the bottom left. A mere splash of color, the rust offers life into an otherwise monochromatic painting. Monochromatic should not be confused with dull however seeing that this painting is full of emotional expression and freedom. Pollock didn’t need to represent his dark emotions by drawing a figure drinking in a dark room alone. Instead, with abstract lines and curves he created a similar emotion in a much more subdued way. Pollock’s seemingly troublesome life ended in 1956 in car crash. He had an immeasurable talent that has been mimicked for years now but never in quite the same honest, moving manner. Some might argue that this isn’t art, just scribbles of paint. However, it’s the way the lines fuse together and colors scream of helplessness that the painting is so much more than a mess. It’s a mess that represents the artisit's life.